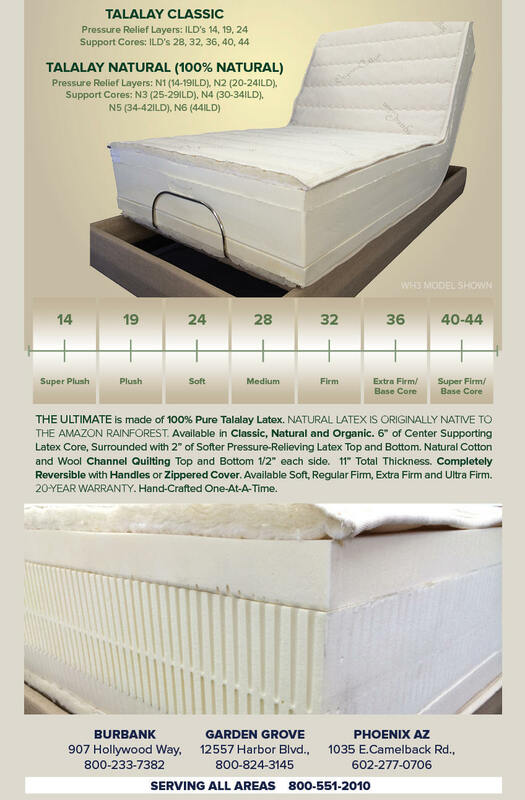 What is 100% Pure Talalay Latex? Latex as found in nature is a milky fluid found in 10% of all flowering plants. In most plants, latex is white. Since the 17th century, latex has been used as a term for the fluid substance in plants. Originally, the name given to latex by indigenous Equator tribes who cultivated the plant was “caoutchouc”, from the words “caa” (tear) and “ochu” (tree), because of the way it is collected. 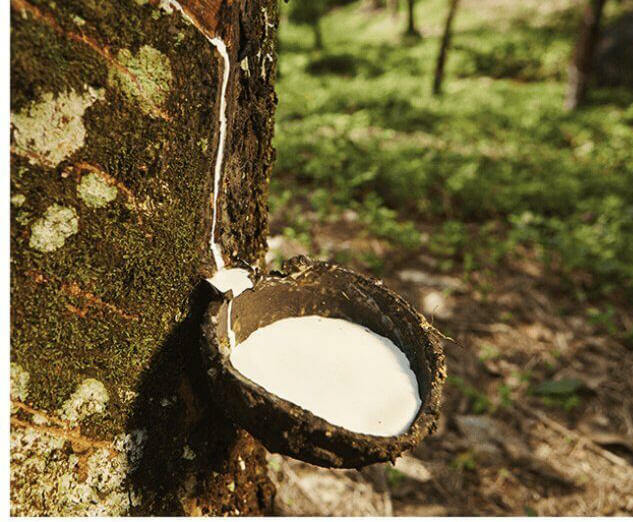 The major commercial source of natural rubber latex is the Pará rubber tree, Hevea brasiliensis. This species is preferred because it grows well under cultivation. A properly managed tree responds to wounding by producing more latex for several years. Currently, rubber is harvested mainly in the form of the latex from the rubber tree. The latex is a sticky, milky colloid drawn off by making incisions in the bark and collecting the fluid in vessels in a process called "tapping". The latex then is refined into rubber ready for commercial processing. In major areas, latex is allowed to coagulate in the collection cup. The coagulated lumps are collected and processed into dry forms for marketing. Natural rubber is used extensively in many applications and products, either alone or in combination with other materials. In most of its useful forms, it has a large stretch ratio and high resilience. 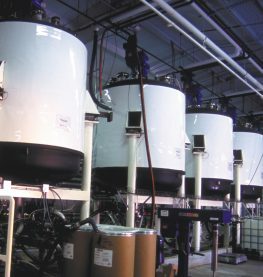 Combination of liquid latex, soaps and rubber curing agents are mixed together in a temperature controlled, stainless steel tank to create a batter. 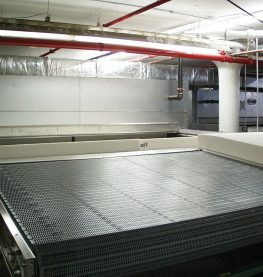 The batter is transferred to the pressroom where it is whipped into a froth and injected into an aluminum pincore mold. The pins create the unique aerated cell structure of our latex. The mold is sealed and a vacuum is pulled to extract air and completely fill the mold cavity with foam. The batter is frozen to a temperature of -20 degrees. Freezing is unique to the Talalay process to prevent particles from settling, ensuring a consistent cell structure. 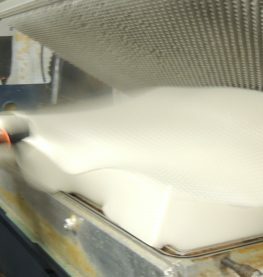 The solid latex is cooled and removed from the mold. 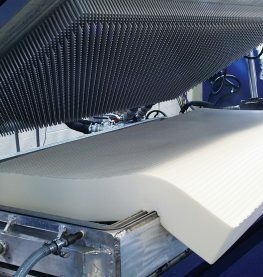 The latex mattress core is removed from the mold and placed on a conveyer belt that brings it through a five-stage fresh water washer, which removes latex proteins, residual soaps and curing agents. 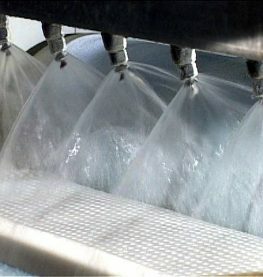 The multi-stage fresh water rinse is also unique to the Talalay process. 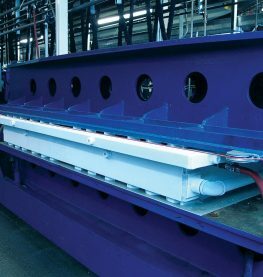 The mattress is transported to a two-lane dryer, which completes the curing process and removes residual moisture. Quality Testing – Only the best pass the test! 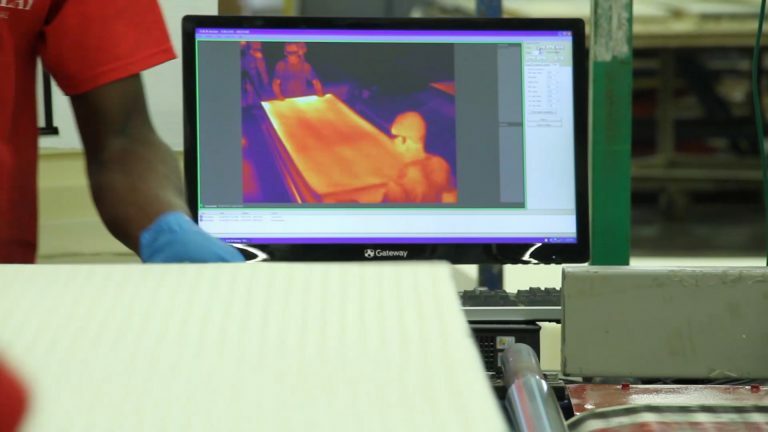 Once dry, EVERY mattress undergoes a nine-point firmness consistency test and infrared technology scan to ensure they meet our stringent quality standards. Talalay truly is Earth’s most perfect sleep material. It combines uniquely buoyant support, amazing breathability, and natural health benefits in a way no other material ever has. That’s why you’ll find it in the world’s most luxurious mattresses. And why we’re using the world’s finest Talalay—pure American Talalay—in our Talalay Living sleep products. It’s Naturally Healthy You care about the ingredients in your food and household products, but have you considered what’s inside your pillows and bedding? 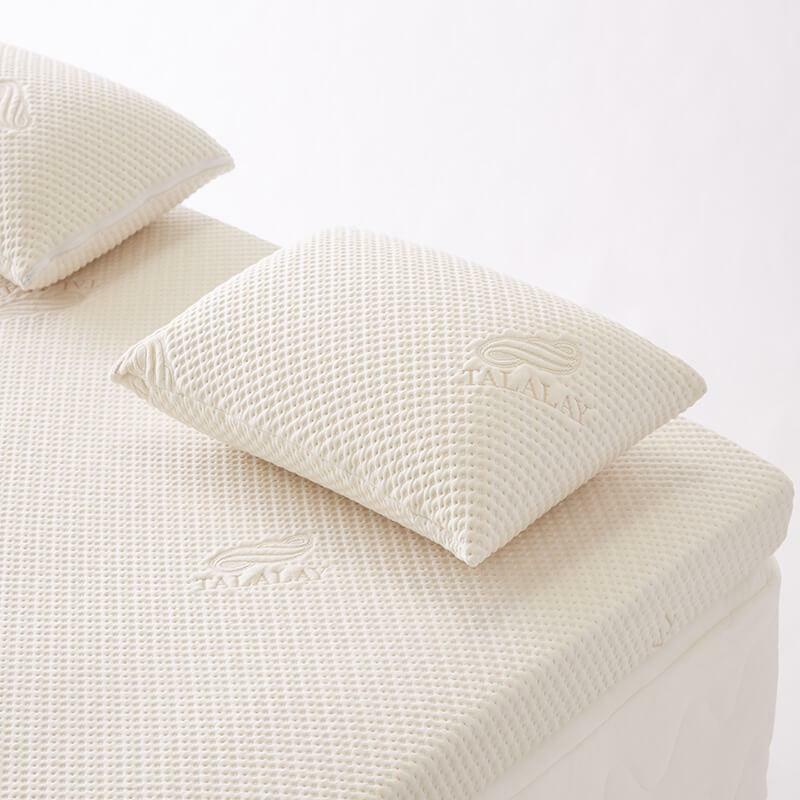 When you sleep on Talalay, you can rest assured that you’re sleeping on healthy, natural ingredients.That’s because Talalay is a gift from the earth, tapped from tropical rubber trees, and gently processed in our eco-responsible Connecticut facility. It’s so healthy, it’s been granted a CLASS I Certification by Oeko-Tex, the global standards organization for textile health and safety. That means our Talalay is not only free of harmful substances, it meets or exceeds the requirements for products meant to come into direct contact with babies—the most stringent Oeko-Tex category. And since Talalay is inherently hypoallergenic and resistant to dust mites, mold, and mildew, it’s also ideal for those who suffer from allergies and asthma. It’s Luxuriously Comfortable Talalay has a buoyant feel that’s unlike any other sleep material. You don’t sink into Talalay; you float. It’s exceptionally resilient and responsive, too, allowing it to conform instantly to your body’s curves—whether you’re on a Talalay pillow or topper—relaxing muscles, relieving tension, and promoting proper spinal alignment. 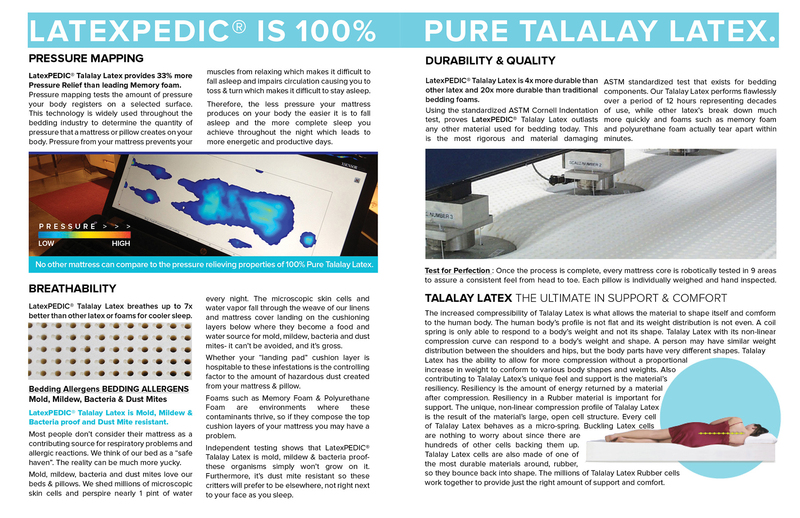 And thanks to our exclusive TalaFlex™ Open-Cell Technology, Talalay is the most breathable sleep material available. Our technology maximizes air circulation and maintains the optimal temperature for your comfort to help you get the restorative sleep your lifestyle demands. 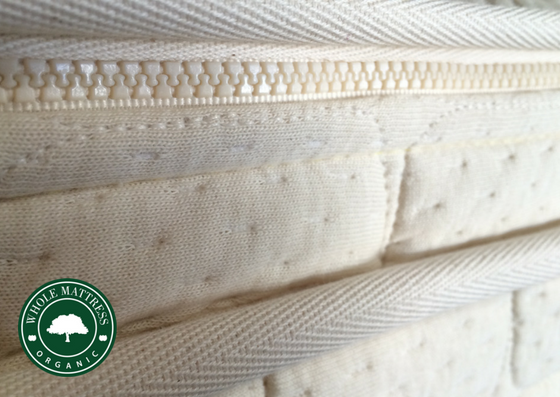 It’s Environmentally Friendly Talalay is also kind to the environment. The natural, biodegradable ingredients come from renewable resources and water-based raw materials. The rubber trees are not damaged during the harvesting process. In fact, they are productive for 25 years, absorbing carbon dioxide from the atmosphere and helping to reduce greenhouse gases. It’s Your Life You can’t put a price on your health and vitality, so don’t compromise when it comes to the material you sleep on. Stop tossing and turning. Choose Talalay and get the sleep you need to live the life you deserve. Not all latex is created equal. 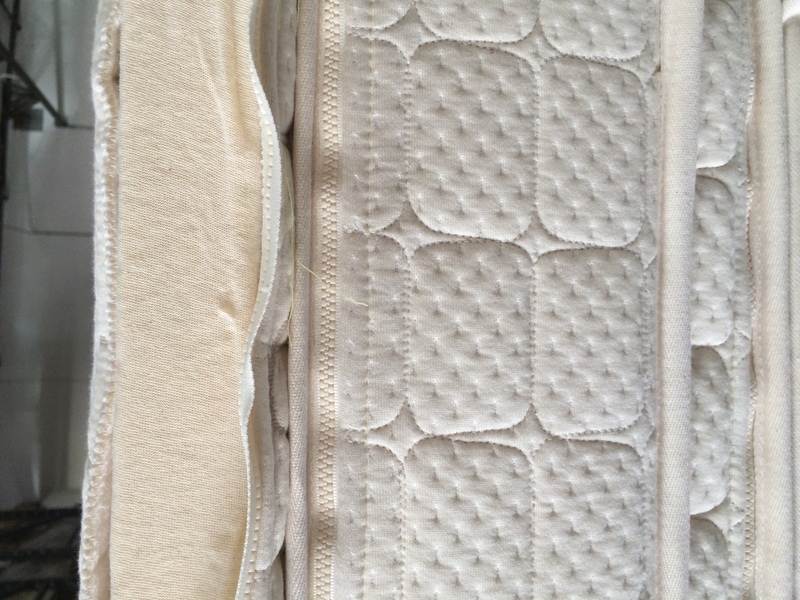 Talalay and Dunlop are the two processes used in mattress production. The Dunlop process was developed in 1929 and was the first method used to produce latex material for bedding. As technology progressed, the Talalay process was developed by the Talalay family during World War II. 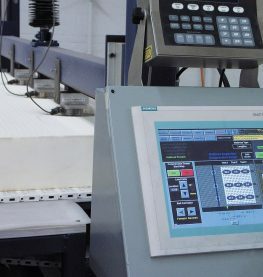 The Talalay process is significantly more complex and costly, but produces softer, more buoyant and luxurious finished products. So why is there such a difference? 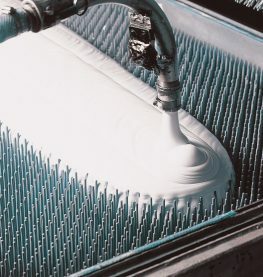 The Talalay process takes four times longer than Dunlop with two additional process steps—vacuum and flash freezing—which improve the consistency, quality and feel of the finished latex. 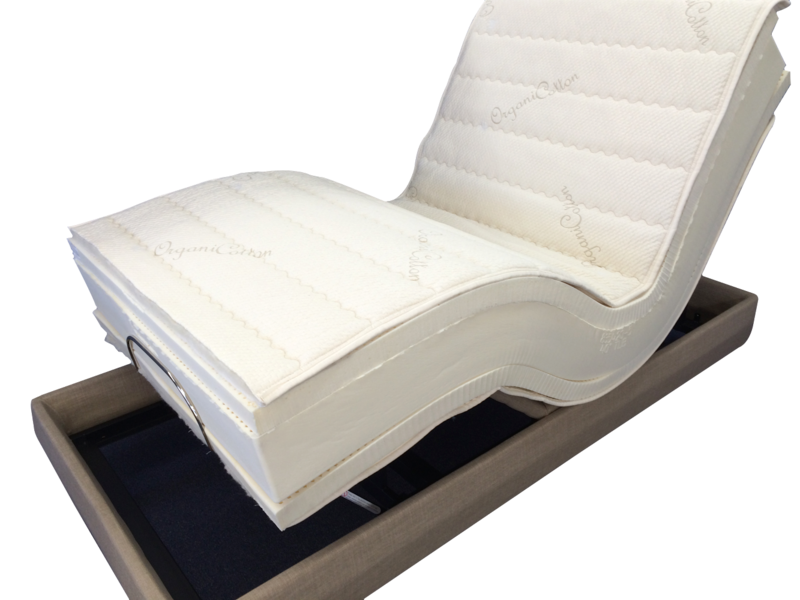 The vacuum evenly distributes the latex throughout the mold, allowing us to create precise and varied feels in the finished Talalay latex. 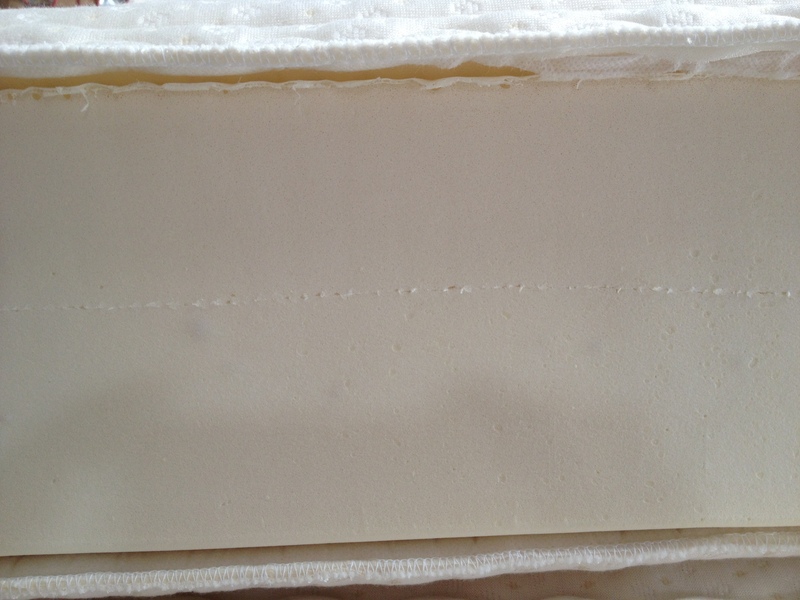 A mattress is made more firm or plush based on how much latex is poured into the mold. With the Dunlop process there is little ability to vary the feel of the finished product because the liquid latex is poured onto a conveyor belt resulting in a dense piece of latex every time. The only way to soften the feel of Dunlop latex is to add “fillers” into the liquid latex formula, which can result in solid latex that is flaky and breaks down quickly. 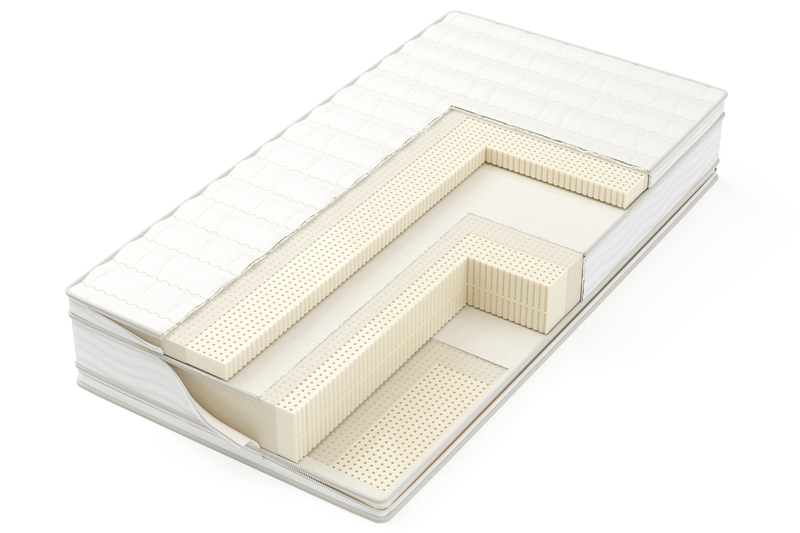 The flash freezing step gives Talalay its consistent feel. Liquid latex is a suspension of rubber particles in water, like a shaken snow globe. Flash freezing prevents the latex particles from settling to the bottom while gelling into a solid product. This means that the resulting piece of solid Talalay latex has the same consistent feel from top to bottom, and side to side. The Dunlop process doesn’t utilize a freeze step. Therefore, the rubber particles settle to the bottom while the liquid latex is gelling into a solid form, resulting in a variation of feel from top to bottom. Think of Talalay latex like a chocolate soufflé; although the process is long, the end product is a buoyant, airy, complex delight. Dunlop latex is more like a pound cake; tasty, but dense and flat in comparison. Only the best pass our tests. Every single bed goes through compression and impact tests to ensure durability and consistency. This test simulates the effect of body impressions on the latex after a person lies on the bed for extended periods of time. 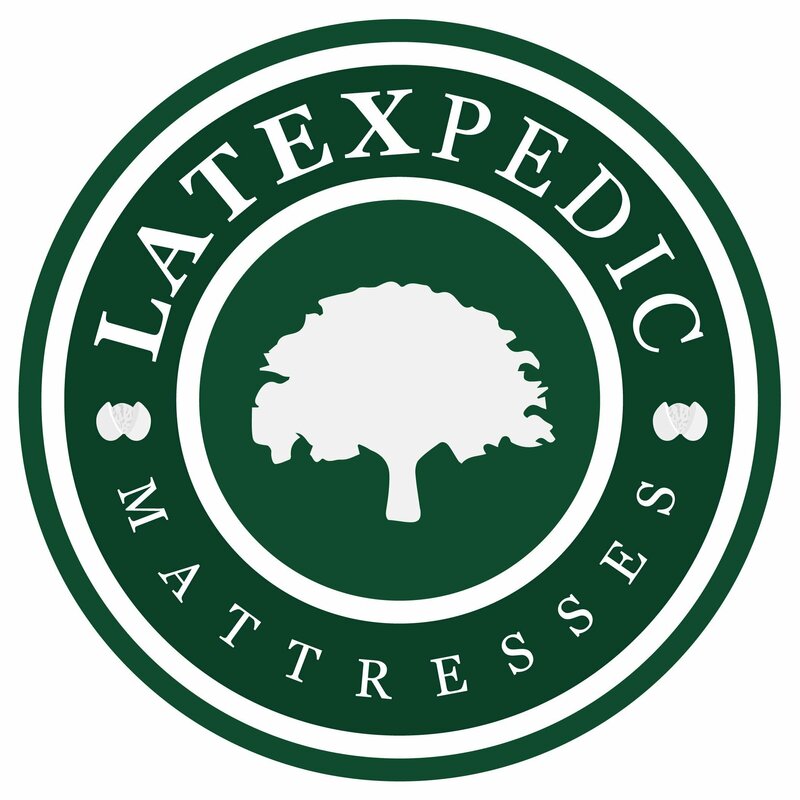 Latex mattress samples are compressed to 50% of their original thickness for 22 hours at 158 ° F. When removed, the percent loss in thickness is measured. The greater the loss thickness, the more likely the bed will take a body impression over time—which leaves you sleeping in a hole. The impact test measures Indentation Load Deflection (ILD), a measure of firmness. 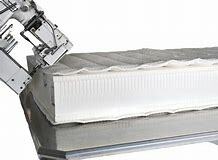 The mattress core is ILD tested and then placed into a machine where a weight is dropped on the latex repeatedly for 24 hours. The product is then removed from the machine and allowed to recover for 24 hours. ILD is measured again. The greater the loss in firmness from first measurement to the second means the latex is more likely to breakdown over time. To ensure we produce the most consistent feeling products, Talalay Global ILD tests nine locations on every mattress core. We are the only manufacturer in the industry to do so. HOW IS TALALAY LATEX DIFFERENT THAN DUNLOP LATEX? Even though they’re both latex, there are significant differences between our Talalay latex and Dunlop latex. 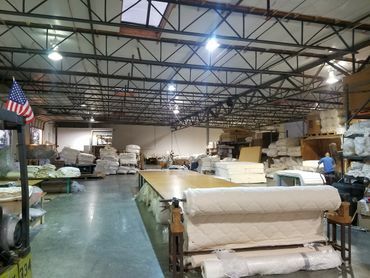 They’re manufactured using different processes; it takes 14 hours to make a Talalay latex mattress core, but less than one hour to make a Dunlop mattress core. Talalay latex is FOUR TIMES more breathable than Dunlop Process latex. Why? Talalay latex is aerated and has a large cell structure. Dunlop latex is denser latex and has a small cell structure. Talalay latex is 33% more pressure relieving than Dunlop latex. Why? The vacuum process used in making Talalay latex allows for the latex to stretch like a rubber band so it conforms to your body. Dunlop latex is a poured process that creates latex which is less flexible. The rubber is more like the rubber in an eraser. Talalay latex is THREE TIMES more resilient than Dunlop latex. Why? 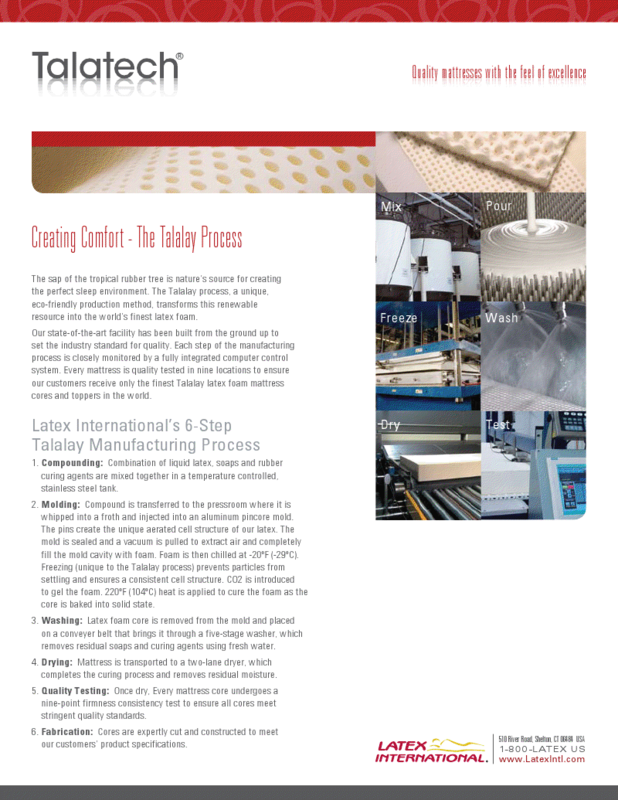 The Talalay latex process creates a round cell structure. As the latex is compressed, a round cell structure does not break itself down. The Dunlop Process creates a snowflake cell structure. As you might imagine, as you compress a snowflake cell structure, the material breaks down. Talalay latex is the same feel from top to bottom and consistent from side to side. Dunlop process latex is softer on top and firmer on the bottom. Why? The Talalay process uses flash freezing that prevents the particles from settling after curing. Because there is no freezing in the Dunlop process, particles setting in the latex during curing creating firmness on the bottom. Talalay latex can wash out more proteins (which is a primary cause of latex allergies) than Dunlop latex. Why? The Talalay latex process uses a five-stage fresh water rinse process. 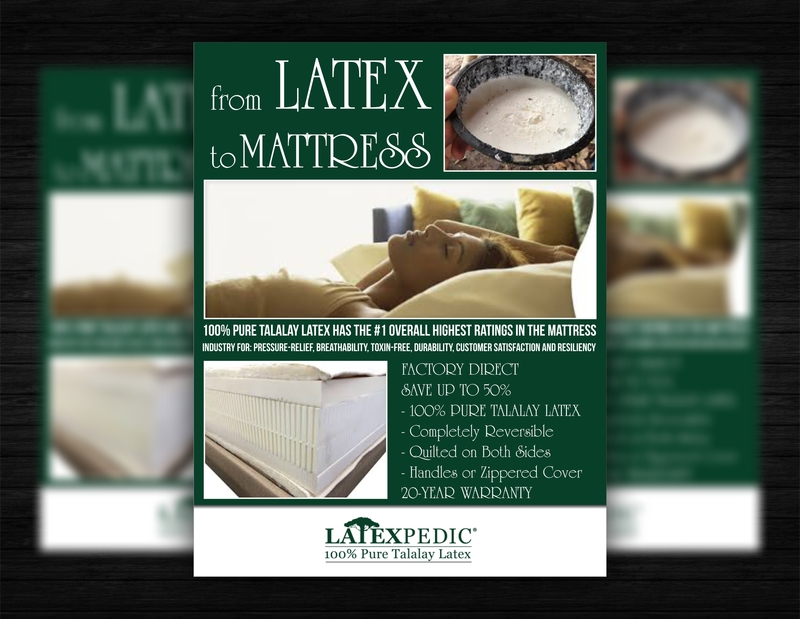 Talalay latex provides not only pressure relief, but also support. Why? Talalay latex is a two dimensional material. It offers support and pressure relief. Dunlop Process latex is a one-dimensional material. It primarily offers pressure relief similar to foam. 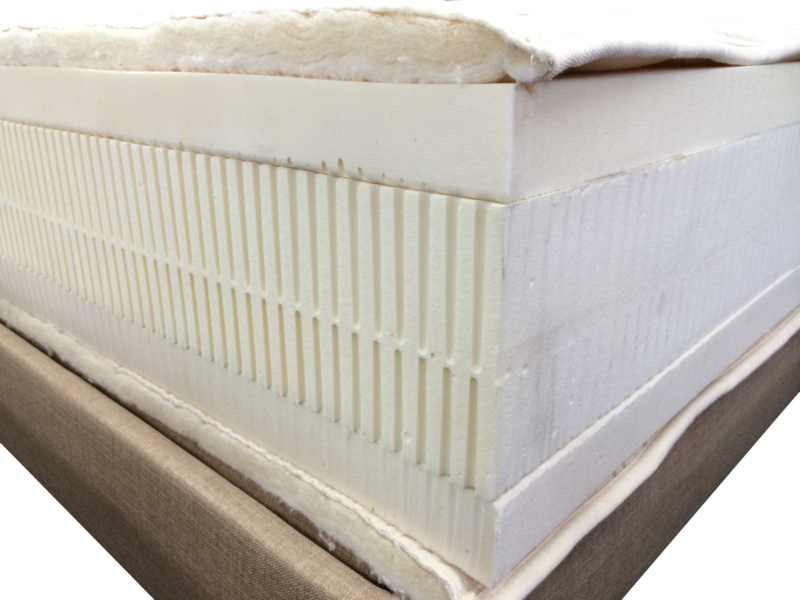 WHAT IS THE DIFFERENCE BETWEEN TALALAY LATEX AND MEMORY FOAM? Both Talalay latex and Memory Foam are marketed as the premium mattress materials, but they are very different. Talalay latex is a rubber. Memory Foam is a foam, which doesn’t provide both support and pressure relief. 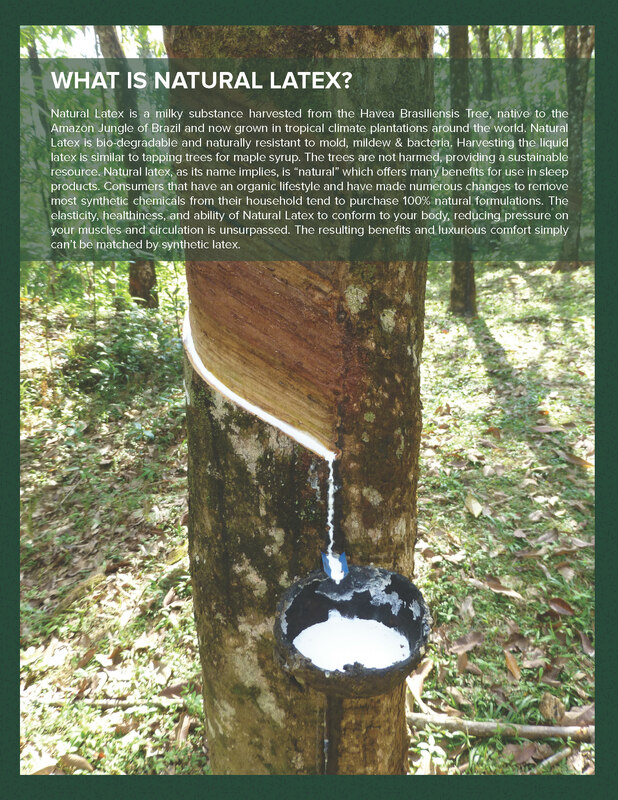 Talalay latex rubber is a natural material derived from the rubber tree. Memory foam is a synthetic material and is a petroleum-based product. You “sleep on” Talalay latex rubber and it has an uplifting effect. 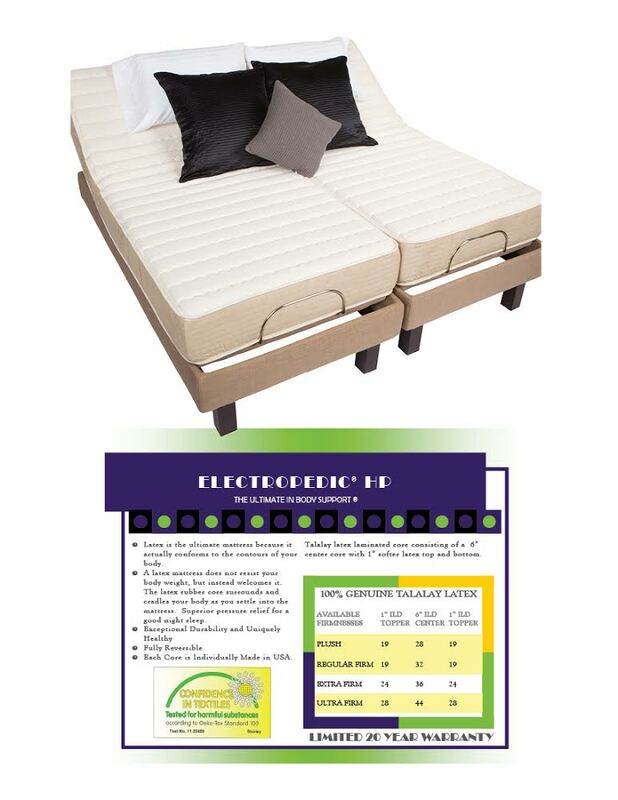 You “sleep in” memory foam which provides a “sinking” effect. Talalay latex rubber is two dimensional material. It is both supportive by being uplifting and is also pressure relieving. 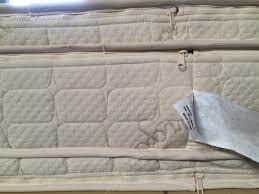 Most memory foam mattresses use memory foam in the pressure relief layer and traditional poly foam in the support layer. 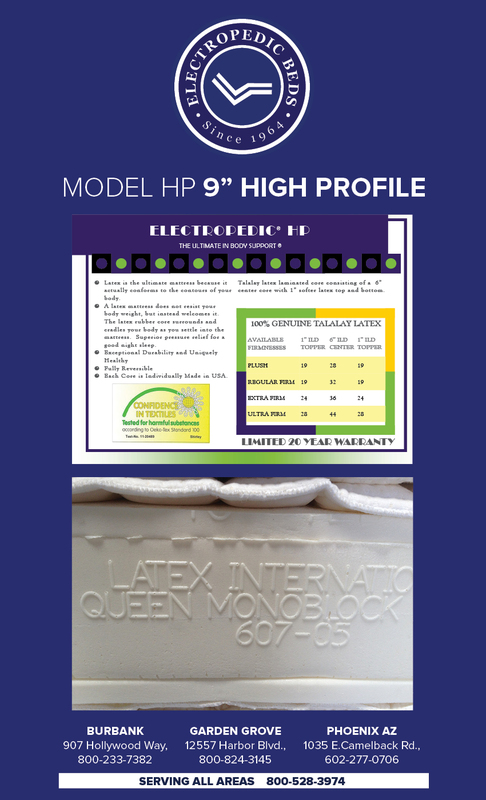 Talalay latex rubber is hypoallergenic and does not off-gas. Memory foam is a petroleum-based product. 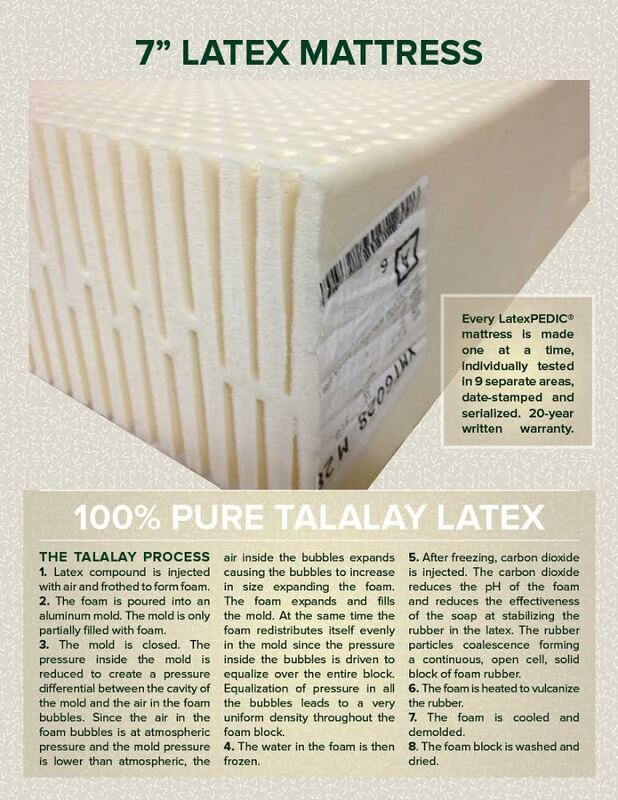 Talalay latex rubber is extremely durable. Because it is vulcanized, it is the most resilient material available in a mattress. Talalay latex rubber is inherently antibacterial and antifungal. You spend about 1/3 of your year in bed, so it’s important to know what you’re sleeping on. WHAT HEALTH AND SAFETY STANDARDS DOES TALALAY GLOBAL OPERATE UNDER? 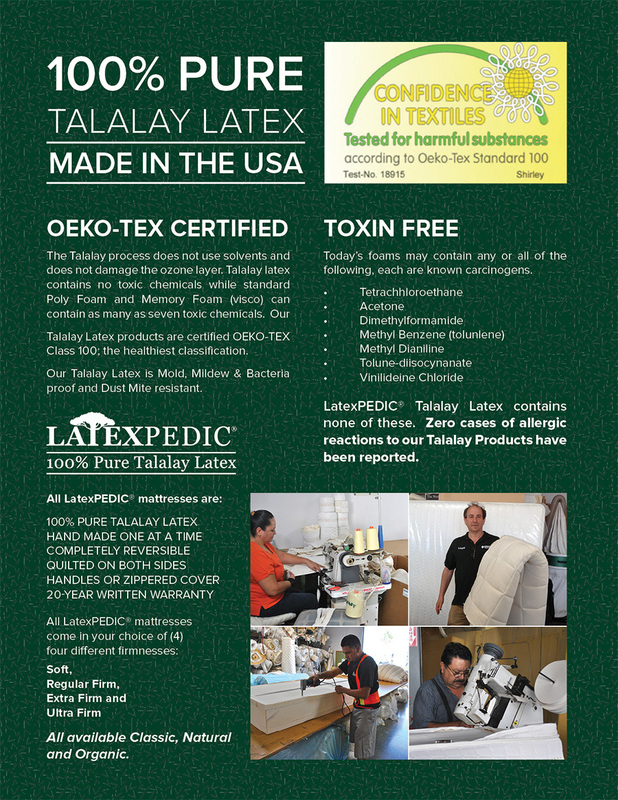 Our Talalay latex Products are Oeko-Tex certified, Class I. 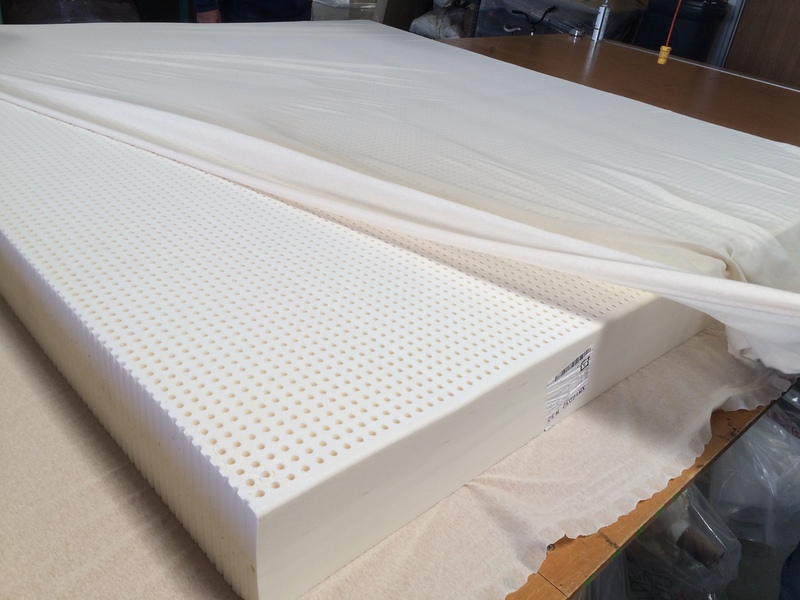 Our Talalay is manufactured in Shelton, CT.
HOW IS TALALAY LATEX ENVIRONMENTALLY FRIENDLY? The manufacturing process does not use solvents and does not damage the ozone layer. Talalay Global’s Talalay latex is certified by Oeko-Tex (Europe’s highest environmental consumer product standard) to be free of harmful substances or chemicals. 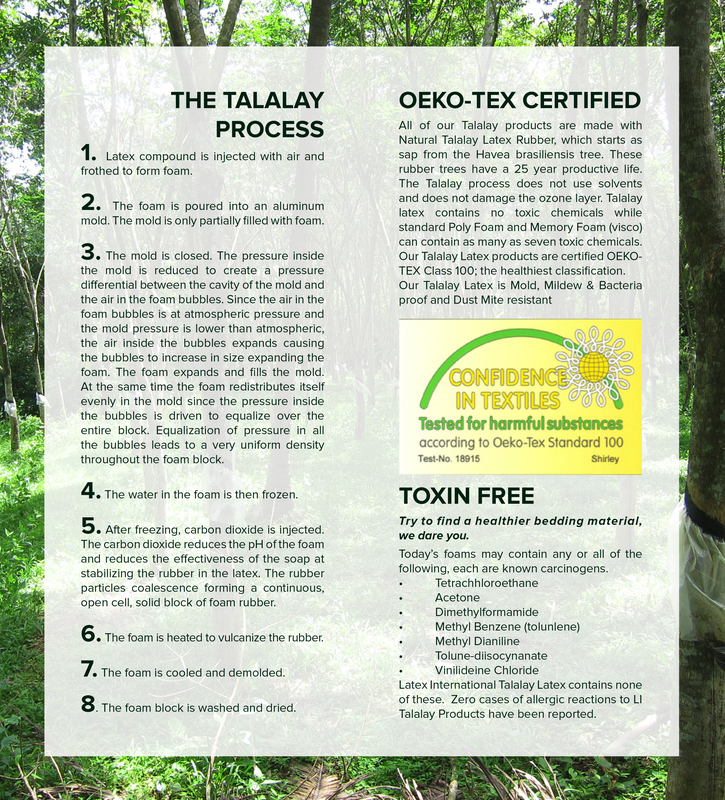 Talalay latex rubber is made using an eco-friendly production method. 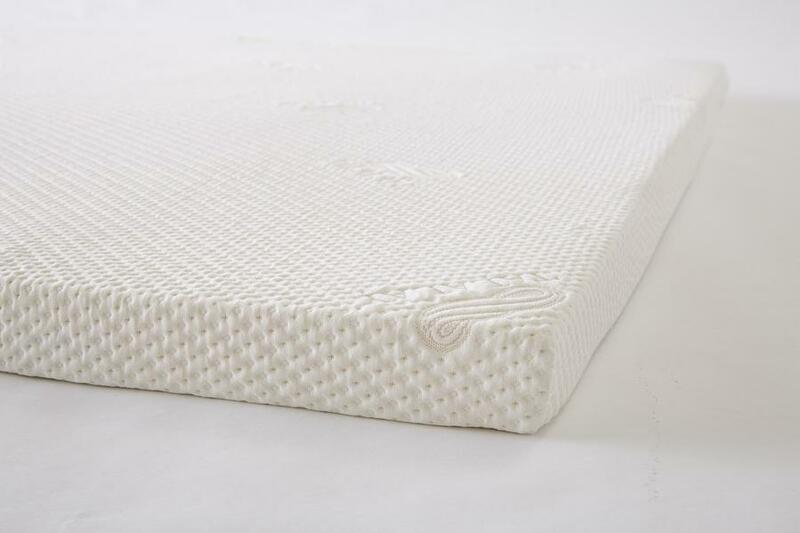 The Talalay process features natural, biodegradable ingredients that come from renewable resources and water-based raw materials: natural latex, air and water. 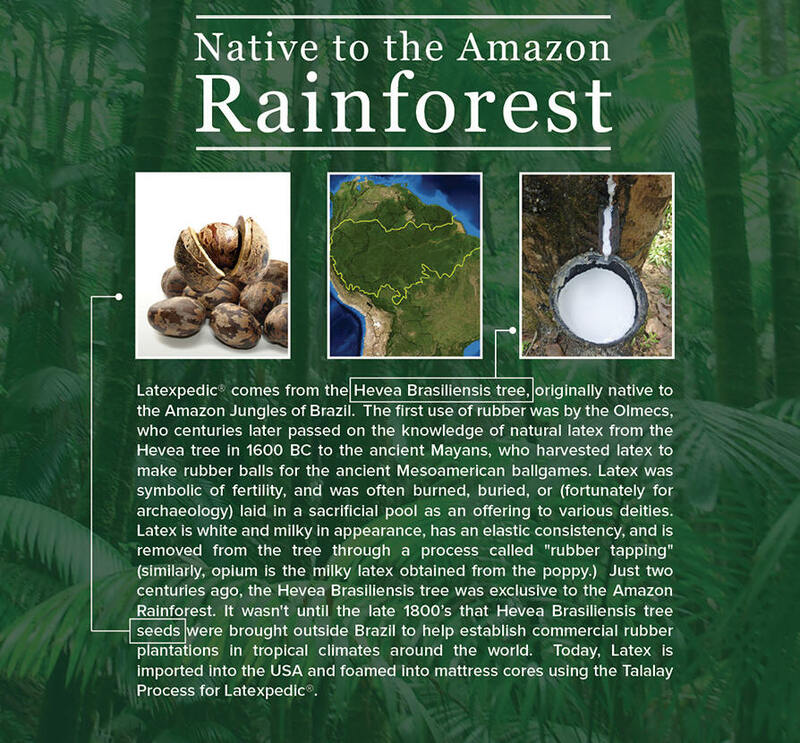 Latex is a rubber-based material that comes from the tropical hevea brasiliensis tree. These trees have a 25-year productive life and they have a strong effect on the environment as they quickly absorb carbon dioxide from the atmosphere and help reduce greenhouse emissions. Talalay latex rubber is made with energy and water conservation in mind. 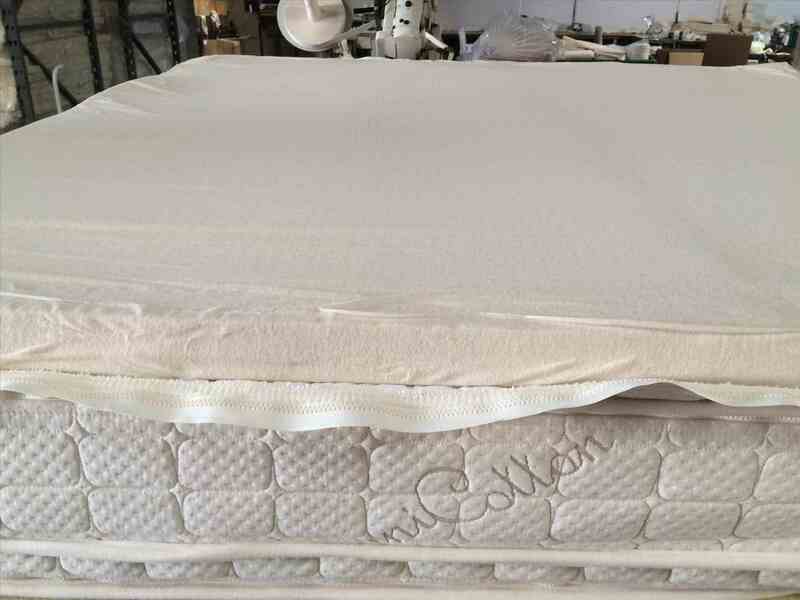 WHAT ARE THE REASONS TO INVEST IN A TALALAY LATEX MATTRESS? It offers “bottomless” pressure relief for your body. Whether you are on your back or side, you will have less pressure on more inches of Talalay latex. Did you know when you lay on your side, your shoulders and hips have 7 times more pressure on them than when you lay on your back? Pressure relief is important to your muscles and it keeps the blood flowing to your extremities so you don’t have numb fingers, hands and arms. But more importantly, your body responds to pressure by moving during the night which will likely lessen the quality of your sleep. It offers “uplifting” support for your body.Your body needs support. It needs it for ideal body alignment and ideal spinal alignment. The benefit of good support is good posture. We love the phrase, better posture at night equals better posture during the day. Talalay latex offers an effect that is not found with traditional bedding materials. Talalay latex is uplifting and it is also pressure relieving. 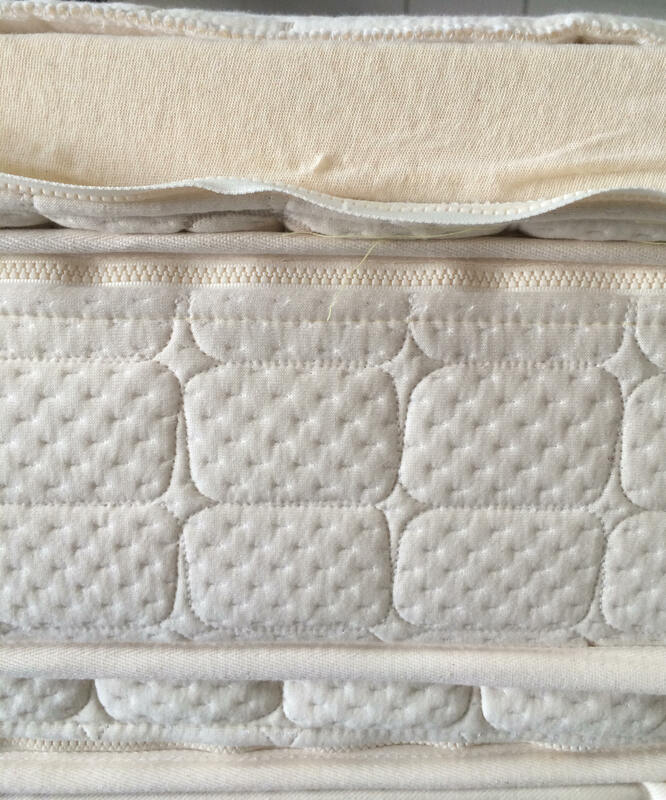 All other materials in a mattress are either one or the other, but not both. Most people think they need a firm bed, but that is only partially true. They need a bed with strong support, but they also need a bed that offers pressure relief on top of that. Firm on the bottom and soft on top is probably a more ideal formula. It offers a “resilient” natural rubber construction.Most people want a mattress to last a long time. It is a big investment. Simply put, you can buy an $1,000 mattress three times over the years or you can buy one $3,000 mattress and have it last 15 years. Talalay latex is incredibly resilient. The easiest way to understand that Talalay latex lasts longer is to understand that Talalay latex is a rubber not a poly foam. Rubber is more resilient. It’s the nature of the material. Congratulations! You’ve discovered the secret to extraordinary sleep: Pure American Talalay. 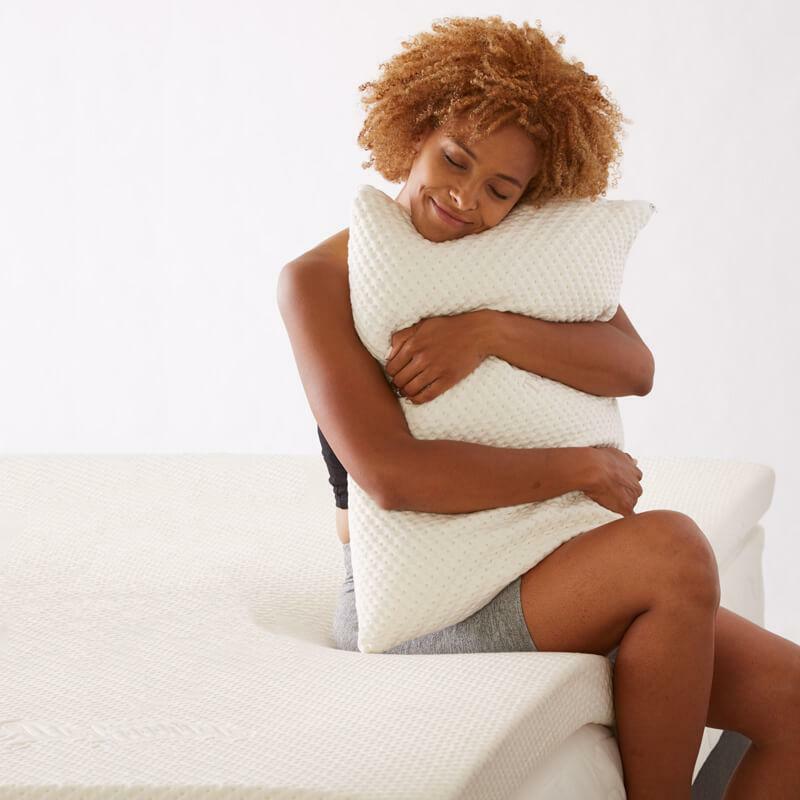 With its magically buoyant feel and amazing breathability, Talalay has long been the comfort material of choice in high-end luxury mattresses. Now we’re making that Talalay comfort available to everyone, with our line of premium yet affordable Talalay Living pillows and toppers. Nothing sleeps like Talalay. Watch our videos to see what makes Talalay different—and why it’s the natural sleep solution you need to live the extraordinary life you deserve. Pillows made from 100% American Talalay gives a luxuriously buoyant feel you’ve never felt in pillows before. Out plush foam gently supports your head and neck for proper spinal alignment, relieving tension and promoting the deep, restful sleep your body has been craving. Talalay Latex pillows are naturally breathable - yet we make it more breathable still with our exclusive TalaFlex™ Open-Cell Technology. The unmatched airflow keeps you at a comfortable temperature all night long, because the pillows allow more airflow. 2" or 3″ Plush Talalay Mattress Topper with an ultra-soft bamboo cover. Luxuriously plush, with just the right amount of firmness to delight most sleepers. WHAT DOES IS ALL MEAN . . . FACTORY DIRECT?